Brain ischaemia. 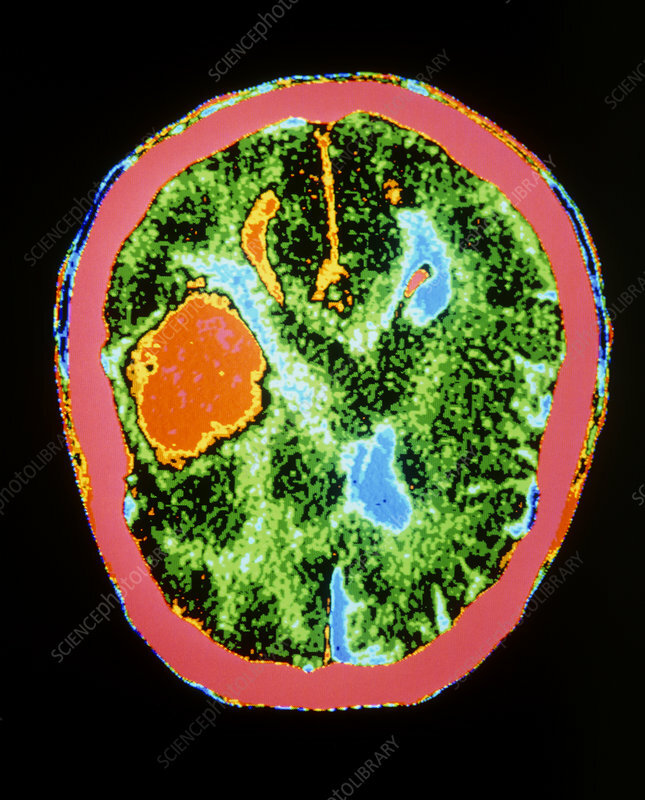 False-colour computed tomography (CT) scan of an axial section through the brain, showing ischaemia. At centre left (red) is an area affected by reduced blood flow, or ischaemia, to the right cerebral hemisphere. Regions of the brain with a normal blood supply appear green. Ischaemia is caused by constriction or blockage of blood vessels. This may result from blood vessel spasm, injury, or disease such as atherosclerosis (deposits of fatty plaque in the arteries). The areas affected may suffer oxygen depletion and even tissue destruction. Treatment may include vasodilator drugs to widen the blood vessels or, in more serious cases, surgery may be necessary.